> Ocean thermal power makes use of the temperature difference between the warm surface water and the cold deep water. > Surface water in the tropics can reach a temperature of 25oC whilst the water in the depths is very cold, about 5oC - a difference of 20oC. > The hot and cold water is used to boil and condense butane gas in a special turbine called an Organic Rankine Cycle Engine. > Experiments have been made to work in the Pacific Ocean but the engineering difficulties are very great. 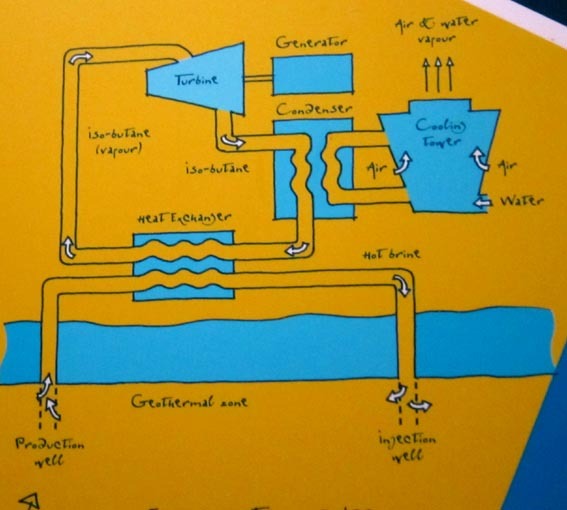 > Huge amounts of cold water must be pumped from depths of 1000 metres or more to make the system work. ＊　diagram terms:　iso-butane(vapour), turbine, generator, condenser, cooling tower, air and water vapour, heat exchanger, hot brine, geothermal zone, production well, injection well. [参考] Rankine Cycle: n.[理]ランキンサイクル[蒸気サイクルの一様式;　熱エネルギーを機械的仕事に変換する]　W.J.M. ランキンは英国スコットランドの技師・物理学者.